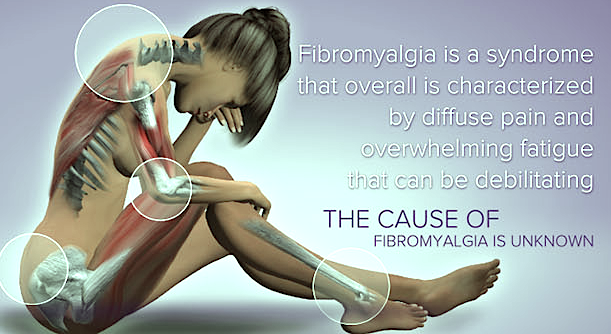 Fibromyalgia (FM) is characterized by widespread musculoskeletal pain, fatigue, and multiple tender points. “Tender points” refers to tenderness that occurs in precise, localized areas, particularly in the neck, spine, shoulders, and hips. People with this syndrome may also experience sleep disturbances, morning stiffness, irritable bowel syndrome, anxiety, and other symptoms. How Many People Have FM? According to the American College of Rheumatology, Fibromyalgia affects 3 to 6 million Americans. FM primarily occurs in women of childbearing age, but children, the elderly, and men can also be affected. Fibromyalgia is difficult to diagnose because many of the symptoms mimic those of other disorders. The physician reviews the patient’s medical history and makes a diagnosis of based on a history of chronic widespread pain that persists for more than 3 months. The American College of Rheumatology (ACR) has developed criteria for FM that physicians can use in diagnosing the disorder. According to ACR criteria, a person is considered to have FM if he or she has widespread pain in combination with tenderness in at least 11 of 18 specific tender point sites. Treatment requires a comprehensive approach. The physician, physical therapist, and patient may all play an active role in the management of fibromyalgia. Studies have shown that aerobic exercise, such as swimming and walking, improves muscle fitness and reduces muscle pain and tenderness. Heat and massage may also give short-term relief. Antidepressant medications may help elevate mood, improve quality of sleep, and relax muscles. Patients with FM may benefit from a combination of exercise, medication, physical therapy, and relaxation. What Are The Natural Remedies / Alternative Treatments for fibromyalgia? The reassuring term “natural remedies”, that is often applied to herbal and some dietary supplements can be misleading. The fact is that these alternative remedies are not controlled by the Food and Drug Administration (FDA) in terms of purity, quality or quantity of contents. To date there have been no controlled studies documenting the usefulness of any alternative medications in the treatment of fibromyalgia. Of course, absence of studies does not mean that alternative medications are useless. However, before you spend money on such medications, it would be worthwhile to do some homework. In particular check out the side effects of the medications you are taking or intending to take, and in particular look for dangerous interactions with drugs you are already taking for your treatment of FM. Recommended alternative treatment and research. structures such as muscles, tendons, and ligaments, as well as the protective covering of internal organs. Autoimmune disease: One in which the immune system destroys or attacks the patient’s own body tissue. Cartilage: A tough, resilient tissue that covers and cushions the ends of the bones and absorbs shock. Chronic disease: An illness that lasts for a long time. Collagen: The main structural protein of skin, tendon, bone cartilage, and connective tissues. Connective tissue: The supporting framework of the body and its internal organs. the neck, spine, shoulders, and hips. The disorder includes widespread pain, fatigue, and sleep disturbances. Fibrous capsule: A tough wrapping of tendons and ligaments that surrounds the joint. Flare: A period in which disease symptoms reappear or become worse. Genetic marker: A specific tissue type or gene, similar to a blood type, that is passed on from parents to their children. Some genetic markers are linked to certain rheumatic diseases. Immune response: The reaction of the immune system against foreign substances. When this reaction occurs against substances or tissues within the body, it is called an autoimmune reaction. Immune system: A complex system that normally protects the body from infections. It combines groups of cells, the chemicals that control them, and the chemicals they release. Inflammation: A characteristic reaction of tissues to injury or disease. It is marked by four signs: swelling, redness, heat, and pain. Joint: A junction where two bones meet. Most joints are composed of cartilage, joint space, fibrous capsule, synovium, and ligaments. Joint space: The volume enclosed within the fibrous capsule and synovium. Ligaments: Bands of cordlike tissue that connect bone to bone. Muscle: A structure composed of bundles of specialized cells that, when stimulated by nerve impulses, contract and produce movement. Myopathies: Inflammatory and noninflammatory diseases of muscle. Myositis: Inflammation of a muscle. Nonsteroidal anti-inflammatory drugs (NSAIDs): A group of drugs, such as aspirin and aspirin-like drugs, used to reduce inflammation that causes joint pain, stiffness, and swelling. Raynaud’s phenomenon: A circulatory condition associated with spasms in the blood vessels of the fingers and toes causing them to change color. After exposure to cold, these areas turn white, then blue, and finally red. Remission: A period during which symptoms of disease are reduced (partial remission) or disappear (complete remission). Sicca syndrome: A condition manifested by dry eyes and dry mouth. Sleep disorder: One in which a person has difficulty achieving restful, restorative sleep. In addition to other symptoms, patients with fibromyalgia usually have a sleep disorder. Synovium: A tissue that surrounds and protects the joints. It produces synovial fluid that nourishes and lubricates the joints. Tender points: Specific locations on the body that are painful, especially when pressed. Tendons: Fibrous cords that connect muscle to bone. Vasculitis: Inflammation in the blood vessels. It may occur throughout the body.